It’s ten to eight on a frosty Saturday morning when I meet my riding buddy for the day at an industrial state run-down petrol station infamous for being the place that witnessed the end of a 492-day long kidnapping in 1994. There is not a single person in sight except for the lone silhouette of my friend and his Ténéré standing in the morning mist. We are still 50km away from the starting point of the route, half an hour of intense cold and thick fog that makes the road ahead look like a scene straight out of Fargo. 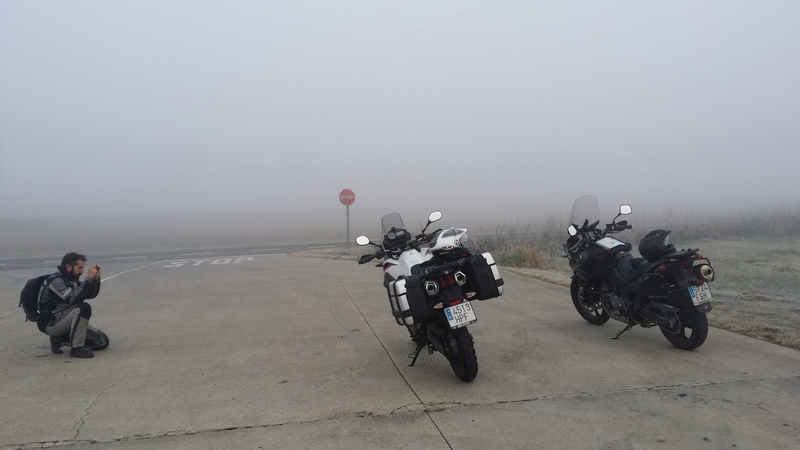 The route we have planned for the day starts just off exit 183 on the C-25 road that connects Cervera and Girona. Despite having heated grips on both motorbikes, our fingertips are painfully cold by the time we turn off the motorway, the hand guards being very good at protecting the brake and clutch levers in case of a fall but not so good at aerodynamic protection for our hands. 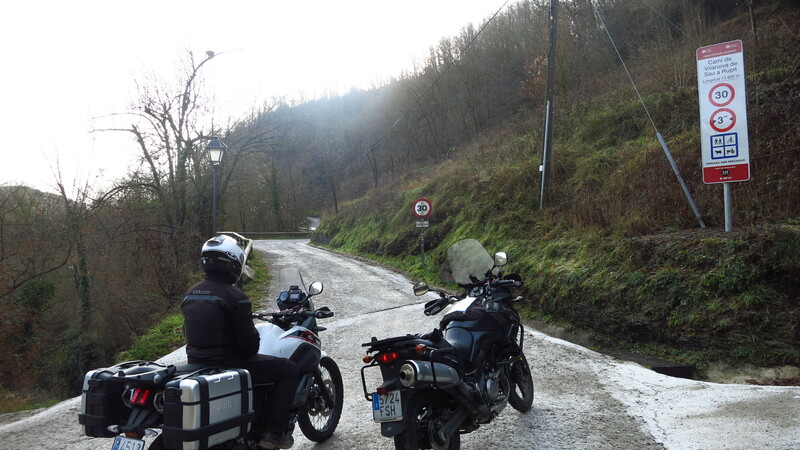 On the C-153 road, we ride across Roda de Ter as the sun struggles to break through the mist, making it hard to get any decent pictures of the old Roman bridge that crosses the river Ter. A few kilometres later, the road starts climbing up the hills through grazing fields, a much more interesting ride after the relatively long motorway slog to get here, but we have to take it easy, as the tarmac is wet and slippery. In the nearby village of l’Esquirol we turn right off the main road and take one of my all-time favourite roads – the BV-5207 leading to Tavertet. 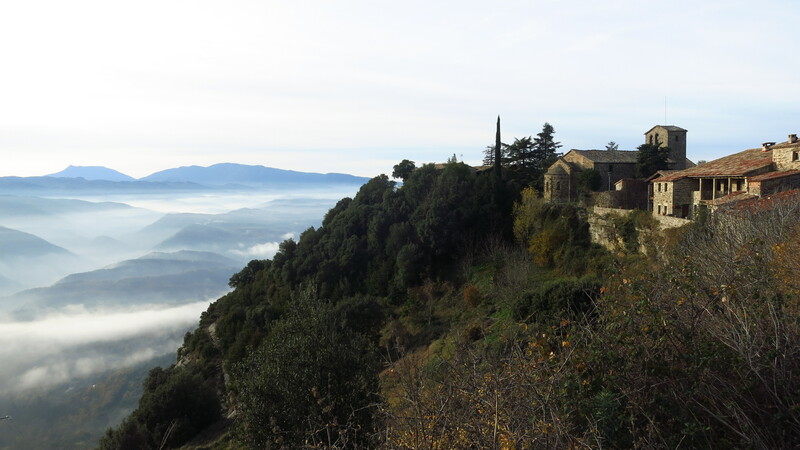 Even though the road ends there, in good weather there are quite a lot of tourists driving it to get to the quaint village perched atop the cliffs overlooking the Ter valley and the Guilleries mountains beyond, but this early on a winter morning the road is ours. It is half past nine now, we have gained enough height to leave the morning mist behind and the sun shines gloriously over the stunning landscape. A few corners before Tavertet we stop at a viewpoint overlooking a valley where a wild boar hunt is taking place and meet an old man who is following it on his walkie-talkie. He tells us that there each year there are more and more wild boars in the area and they have to organize these hunting parties to keep the population under control. His knees are too old for him to join them as he did when he was younger, but he still takes pleasure in checking the progress of the hunting. He points at an orange spot in the thick forest below us – a hunter in a high-visibility vest, and a few seconds later we hear some shots that resonate against the cliffs and sounds like a hundred shotguns being fired at once. 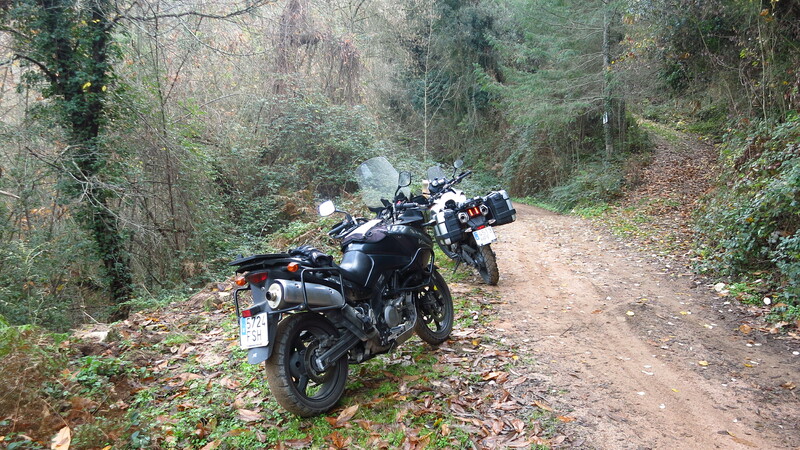 From there the road descends through a beech forest with the ground covered in a carpet of reddish brown fallen leaves to end back in the C-153 road leading to our next waypoint – Rupit. 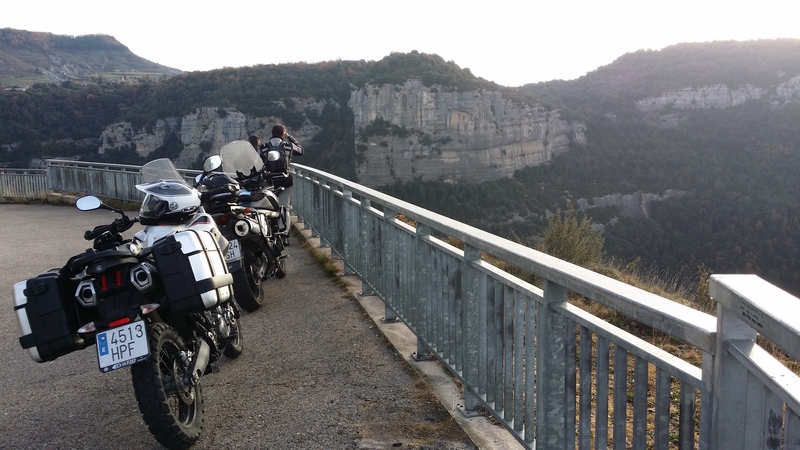 There is a dirt road from Rupit to the Sau reservoir along the foot of Tavertet cliffs. I have used that road twice before – on a mountain bike trip when I was twelve and driving a Fiat Punto when I was at university with my girlfriend at the time. I remembered a dirt road in good condition, and to my surprise we find that it has been paved all the way. 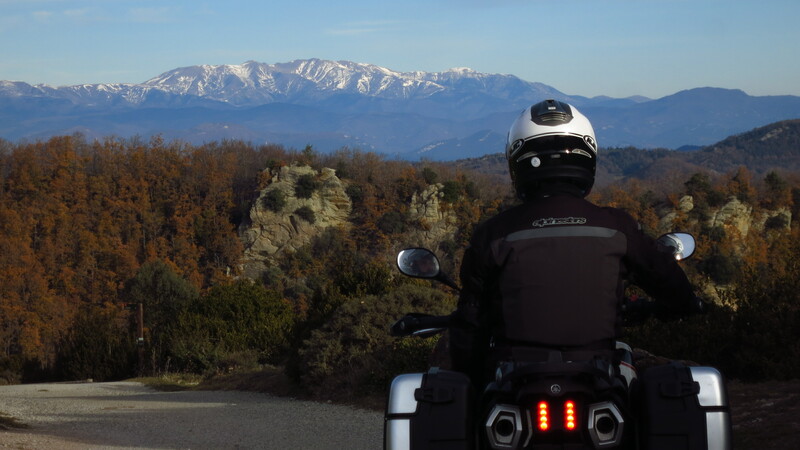 It is a very nice ride through forest and across grazing fields, with views to the rocky cliffs on top of which we were less than an hour ago. Once at the bottom, we take a short detour from our main route to ride to the shore of the reservoir and have a snack with a view of the church spire of the village of Sau, which is all that remains visible after the dam was built. 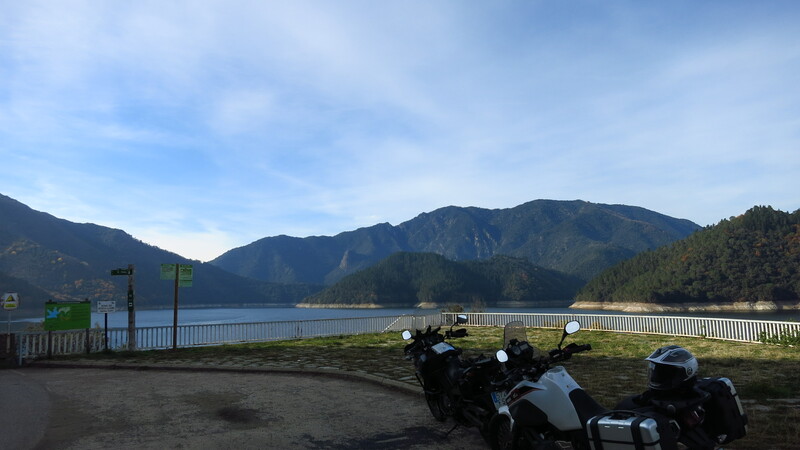 With full bellies but hands still very cold, we ride the few kilometers left to the dam itself to explore the only part of the route I have never ridden before. Looking at maps and satellite images, there seemed to be a road along the south shore of the Susqueda reservoir leading to its dam and then to the C-63 road, but I was not sure it was accessible. It could be a service road for the reservoir or it could be a forest road in bad condition, and I am not particularly keen to venture into difficult terrain as my bike is shod with (worn out) road tires. We cross the dam to where there seems to be a road, but it is blocked and it looks it has been so for a long time. Falling rocks and landslides. We cross back to the northern shore and ride down another road that seems to lead to the power station at the bottom of the dam. It does. It ends in front of a gate, but on the way up we find a dirt road that seems to go further down. It looks steep, at least the first meters, but I notice regular car tracks on the sand, so we think “how hard can it be?” and ride on. An hour later the Susqueda dam comes into view out of the last corner. We are sweaty and my wrists and back hurt from the bad position standing on the footpegs, but I also have a big smile on my face. We have made it. 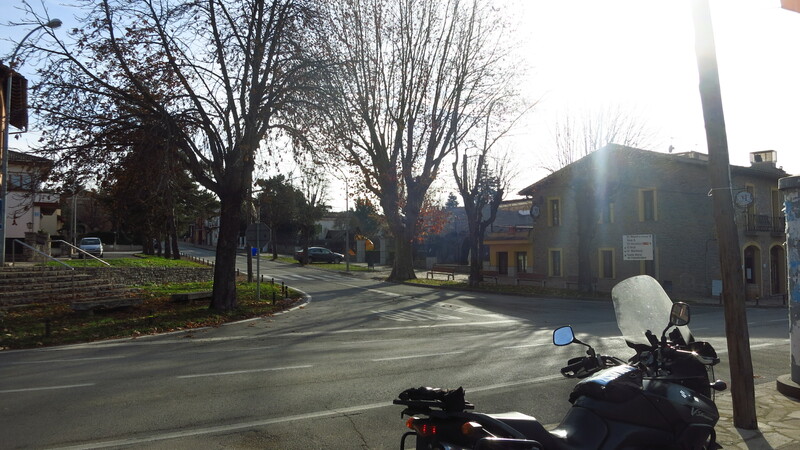 A good road leads to the C-63, which we take for a short while before reaching Anglès and turning into the GI-542 for the last part of our route. This road winds its way up the Guilleries mountains past the village of Osor and to Sant Hilari de Sacalm, famous for its many springs that produce much of the bottled water sold in the country. 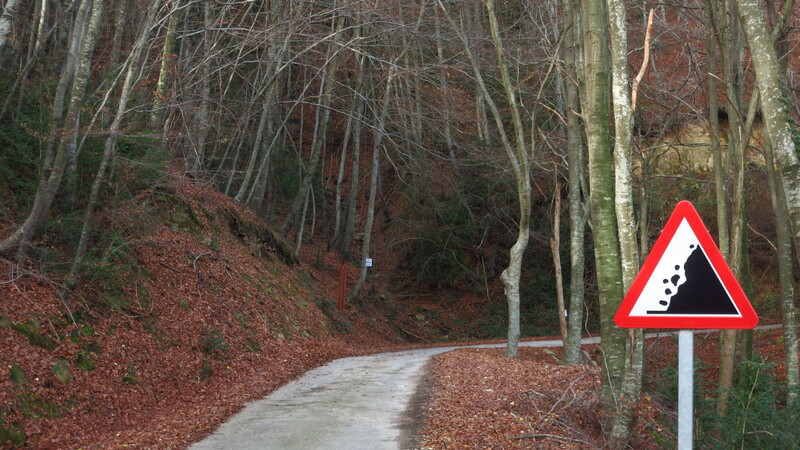 From there we are going to take a smaller road to the Montseny mountains. This one is a bit more difficult to find at first, as it is not indicated anywhere, but then we find out that it is as easy as to follow the signs pointing to “Fontvella”, the main bottling plant in the area, from where the road starts. 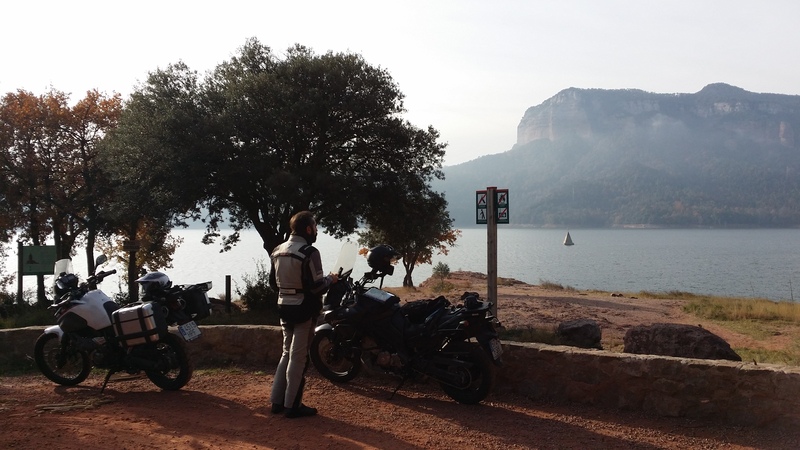 It is well past midday now and the road is completely dry, so we can ride faster and enjoy a wonderful road – perfect tarmac, no traffic, great views. Shortly after we cross the C-25 again, and take the GI-543 and BV-5303 along the northern edge of the Montseny natural park to end our route back on the C-17 main road to Barcelona. 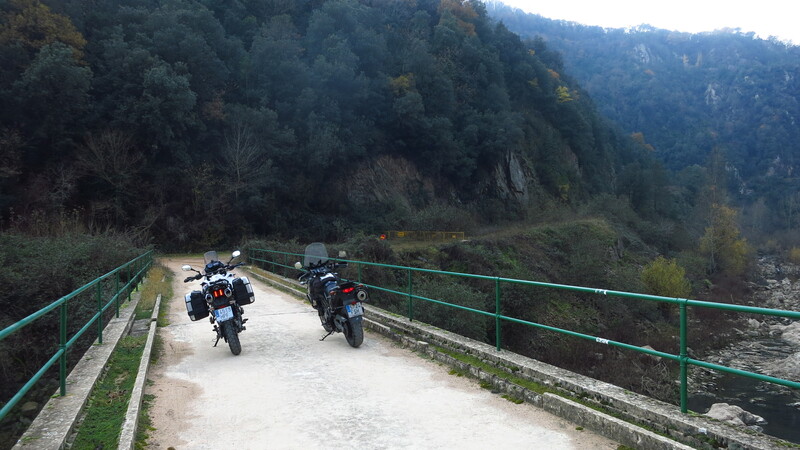 Roda de Ter – Old Bridge: dating back from Roman times, it was part of the Strata Franciscana, the road that led to France. Tavertet – A quaint, tiny cluster of stone houses built on the edge of the cliffs of the same name. Well worth a visit and a hike in the surrounding area, with breathtaking views of the whole region at your feet. Rupit – A XII Century village of narrow steep cobbled streets, with a hanging wooden bridge and the remains of a medieval castle. Pantà de Sau – The spire of the bell tower is all that remains visible of the village of Sant Romà de Sau, which was submerged after the construction of the dam in 1962. When the water level is low enough during summer draughts the church emerges an can be accessed on foot from the shore. 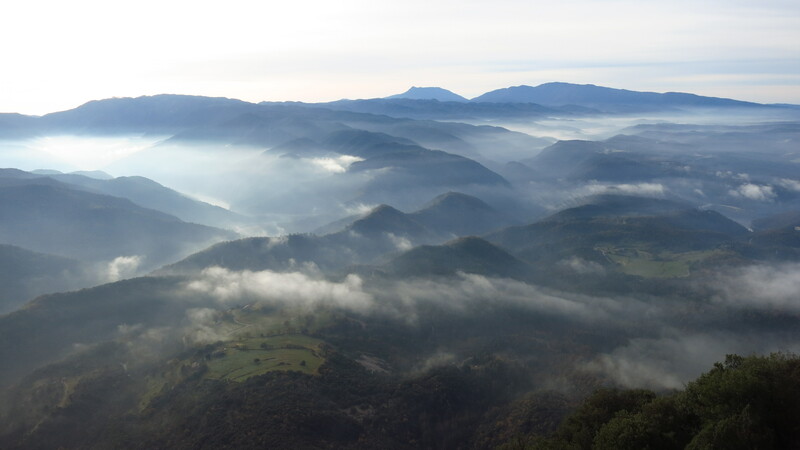 Once you reach Seva, practically at the end of the route, a seven-kilometre detour up the BV-5301 takes you to two excellent restaurants that serve traditional home-made Catalan food in the hamlet of El Brull – Can Pasqual and Castell del Brull. 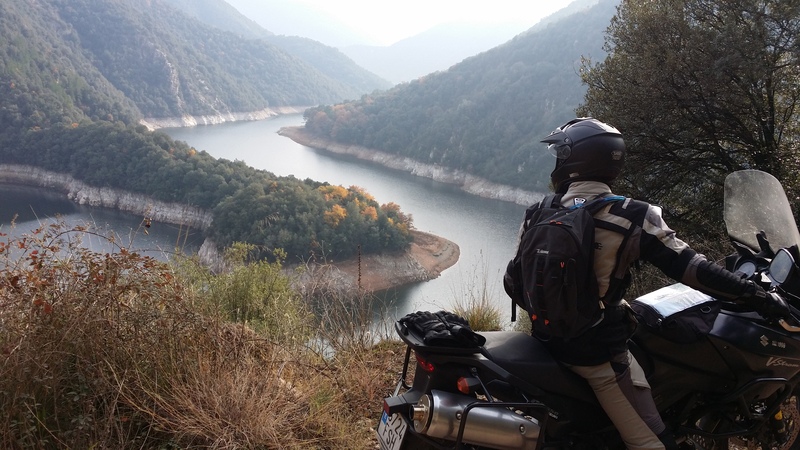 This entry was posted in Travel and tagged El Brull, off road, Osor, Pantà de Sau, Pantà de Susqueda, Roda de Ter, route, Rupit, Sant Hilari Sacalm, Seva, Tavertet by Kilian. Bookmark the permalink.